Villa Steel Magnolias....Former Home of Oscar winner Olympia Dukakis ! YOU WILL LOVE THIS VILLA LOCATION AND VIEWS! The Villa owners, partners and managers are happy to announce we are now taking bookings and Winter, Spring and Summer Holidays for 2019 dates! The Island People . food, sun, sand and beaches are now as great as before. YOU WILL NOT FIND A BETTER MANAGED OR MAINTAINED VILLA FOR THE PRICE AND LOCATION. PLEASE CONTACT US TO CHECK YOUR DATES. THANKS! THIS IS WHAT YOU HAVE BEEN LOOKING FOR! Come enjoy this private Villa in a truly remarkable tropical setting. This six bedroom, six bath home overlooks the Caribbean Sea and it's mountains on the island of St. Martin, French West Indies in the Caribbean. Located in the Lowlands, an exclusive residential area of St. Martin, Villa Steel Magnolias is the former home of Oscar winning actress Olympia Dukakis. This beautiful villa has apx 2 acres of land that provides privacy, spaciousness and wonderful views of the island and the sparkling sea. We offer full housekeeping and houseman at no extra charge and a private cook available upon request for extra fee. The main entrance to the Villa is gated and private. The Villa is first class from room to room offering a large indoor living/dining area with TV and stereo system both indoors and around the pool area. A large modern kitchen with double fridge, icemaker, new dishwasher and stove are just a few of the features this villa offers. The bedrooms are furnished as follows. All of the bedrooms have pillow top king size beds and all bedroom have private bathroom with shower. Four of the bedroom have double sinks bathrooms and they all have very large showers. Of the now six bedrooms two are Master Bedrooms of which one has a leather sofa sleeper. So we have 5 bedrooms and 5 baths in the main Villa all with private baths and we have 6th large bedroom with leather sofa sleeper and large bath with separate shower and separate Jacuzzi tub! The Villa offer's two master bedroom suites, one in the main Villa with 42' TV and a new master bedroom located in a building of its own overlooking the large pool and with an incredible view of the Caribbean Sea. As already said......This new 6th very large master bedroom also has its own kitchenette with microwave and mini fridge and a 42' Plasma TV! It also has a large bathroom with separate shower and Jacuzzi bathtub! Four of the five bedrooms have French doors that open up to the pool area and with view's of the Caribbean Sea. And here's another great thing about this Villa....The white sand beach at Baie Rouge is just out my back gate and only apx 25 steps away! Very few Villa's offer a great beach just a few steps away. But best of all is the staff at the Villa who will take care of your every need and truely want you to have the very best vacation possible. We do not add and service charges to our rates like many Villa's but you are welcome to tip the staff if you wish at the end or your visit. The Villa Adminastrator will meet you at the airport at no extra charge and return you to the Villa and help you and the rest of your group get ready for some St Martin/St Maarten fun! Over half of our guests are repeat visitors and want you to return year after year. This private Villa is set up for fun and your total comfort so come and enjoy the good life at Villa Steel Magnolias! Contact me today for the best rates possible and we hope to see you at Villa Steel Magnolias soon! WE DO NOT ALWAYS UPDATE AND USE THE ONLINE CALENDAR SO PLEASE CALL OR EMAIL US TODAY TO CHECK YOUR DATES....ask for Brian. Attention Celebrity and High Profile Managers and Agents. FYI, Yes we do routinely sign confidentiality agreements to protect your clients privacy. Property Mangers Brian Cleveland, Mark Cleveland, Nevil Summers...come enjoy! About Property Mangers Brian Cleveland, Mark Cleveland, Nevil Summers...come enjoy! 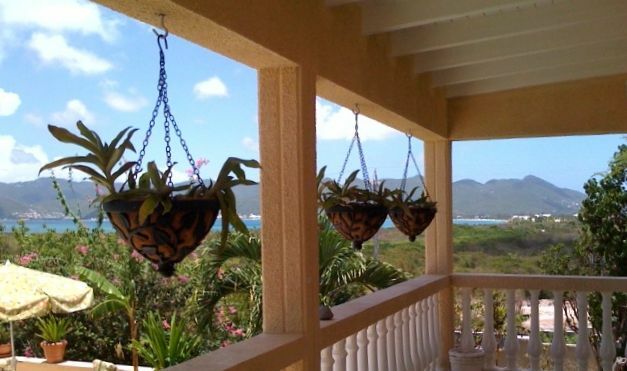 We own and manage vacation homes and properties all over the world and we know you will love staying at Villa Steel Magnolias and Saint Martin as much as we do. The Villa owners and staff know how important a good vacation is and we work hard to make sure you have the very best vacation possible! You will find that the staff at Villa Steel Magnoias make you feel like family and you will leave well rested and well tanned. Come and enjoy! The Villa is located in the very best area of Saint Martin and just minutes from the best of about everything you would be looking for. Villa Steel Magnolias offer many things that you will not find at other Villa like, Dish Network TV, Free USA phone line, Wireless Internet, apx 2 acres of land in a tropical setting and just a few steps away from one of the very best beaches. Most of all...a great caring Staff that will make sure you vaction is the best it can be! View more about Property Mangers Brian Cleveland, Mark Cleveland, Nevil Summers...come enjoy! toilet, tub, shower, jetted tub, Large bathroom with double sinks, jetted tub. Baie Rouge is just apx 30 steps from your back gate. One of the best white sand beaches on the Island! All Bedrooms have great A/C split units which are very quiet. HA HA ... not needed here! You can wash your own our staff can wash for you for a small charge. NOPE....nice and warm all the time. Plenty of pots, pans, glasses, dishes ,etc. Housekeeping is normally included 6 days a week. We do not at a service charge as some do but most guests do tip the staff a little something when they leave the Villa. Houseman also available if needed to help with anything you might need. Cook available for extra fee. Much more to come! The house accommodated our group of 13 very well. All the bedrooms are nicely furnished with great bedding and ensuite baths. Access to the pool from most bedrooms made for awesome gathering place. The kitchen is adequate but a little dated and appliances need updating. Access to beautiful beach is a few steps out the gate and paradise awaits. The staff was very attentive and friendly and house was cleaned almost daily. We also hired the chef two nights and she did an amazing job as well. This was our first time to visit St Martin for an extended vacation and we loved it. The island suffered tremendous damage from hurricane last year but they are rebuilding but still a lot to do. Regardless, the island is amazing and the people are great and we can't wait to come back. Thanks for the kind words and happy to hear you loved the Villa and St Martin. The Island has made a incredible come back after the hurricane and getting even better day by day. Yes I agree about the dishwasher and stove and both were just ordered and replaced with new ones this month. Happy you enjoyed our almost private beach just behind the Villa. Its really is one of the best white sand beaches you will find anywhere in the work. Kind Regards and we hope you return again and again. We loved our week in your home. Neville and the staff was great and the layout of the house cannot be beat. It was clean and neat, easily to navigate and ideal launching point for exploring the island. Great value! Glad do hear you had a great time. We really have a perfect location and our staff just wants all of guests to have the best time possible and works hard to make sure of that. Please keep us in mind for the next time! Very nice, very close proximity to the beach. Lots of room, plenty of beach towels, didn't need to bring toiletries (toilet paper, shampoo and soap) pleasant surprise, kitchen had plenty of plates, utensils, etc... for a party of 12. We really loved the layout of the house with 4 of the 6 bedrooms opening up to the pool. The ability to have music with multiple speakers out by the pool was great! Nice touch was the table in the corner of the pool, so you could cool off in the water with a nice tropical drink. Overall the entire group ages 20 to 75 had a great experience. We love our East coast guests and March is the perfect time to be at Villa Steel Magnolias. Thanks again for your visit and please keep us in mind for the next time. This property is georgeous the people looking after it ,go out of their way to make your stay most enjoyable. All around a beautiful experience. Many Thanks. Thanks so much for the kind words and happy you enjoyed the Villa again this year. Having great guests like you makes it so rewarding. See you next year! Rental prices quoted weekly in US dollars not including tax. Maximum occupancy is normally two adults per bedroom. Base rates are based on one to six people in the Villa with a small extra charge for more than six. Rates & Terms are subject to change without notice. Check out Noon - Check In 1pm. We can work around these times if need if the Villa was not booked the night before. Rates are for one to six people in the Villa. Over six there is a extra charge per extra bedroom needed. All payments are non-refundable once received due to the Villa being unable to be resold while space was being held. However if we are able to re-rent the Villa we can normally make a refund. One half of rental amount is due within 7 days of booking unless its made 7 months in advance or more the just a 25% deposit. The balance is due 30 days prior to arrival at the Villa. Rates based on 6 people with extra nightly charge for over six staying in the Villa. We do not add any service charge as some hotels and Villa's do however most guest do tip the staff a little something at the end of their visit. We have a great staff. Depending on the dates I can normally offer a discount for larger groups so email me for more info and the best quote. Thanks!